Bosque Nuboso Monteverde alias the cloud forest of Monteverde did not get the name by accident. Since we arrived, the place looked exactly as we had imagined before. The forest was dark, quiet, the cloud above us was dripping with moist, moss and plants were growing everywhere around and from time to time, we could hear birds in the distance. Weather in this place can turn either way, but to be honest, we cannot imagine Monteverde with blue skies, the cloud and occasional rain just seem to fit perfectly here. The word Monteverde means green mountain, and it is exactly what it is and what should you be ready to experience here. The exotic fauna and flora can be seen on every single step, so it is not a surprise that Monteverde is a destination well-known among naturalists and bird-watchers. Monteverde Cloud Forest Reserve is paradise for bird-watchers, and photographers or people interested in birds who come here from all around the world to study unique species. There are also many frogs, insects, and snakes, but you can also spot monkeys, tapirs, sloths. Monteverde is also home for cats, but it is very rare to spot them, especially during daylight. Same as in other parks in Costa Rica, you can choose if you want to visit the reserve with a guide or independently. Hiring a guide is definitely a good idea if you want to know more about the forest, the ecosystem and if you want to have a better chance to see wildlife. There is also an option to book a night tour. We opted to visit the cloud forest independently, the same way we did in Manuel Antonio National Park, but this time we were not that lucky and spotted 'only' Quetzal Birds. In other places in Costa Rica, we had a feeling that wherever we look, there is a monkey hanging on a tree or a frog on a leaf, but here in Monteverde no matter how slowly we walked with our eyes open, we could not see a thing. For foreigners, the entrance fee is pretty steep $22 per person. Although in Monteverde Cloud Forest Reserve there is also a quota how many people can visit the forest daily, there were no queues in the morning (we were there during high season in March), and overall the atmosphere was more calm and relaxed than we have expected, similar to Ballena National Park near Uvita. Weather in Monteverde is a chapter on its own. Although books will tell you that the dry season runs from December to April, the truth is that it can rain any time of the year here, simply because you are high in the mountains, at a place where the cloud is hanging above hills most of the time. We were leaving Santa Elena in the morning when the skies were blue, and only 30 minutes later, when we arrived at the entrance, we were in the cloud, and the mist was dampening our faces. It is also much cooler here than in other parts of Costa Rica. The hottest months are March and April, but you will still need a rain jacket (or rain poncho) and a long sleeved t-shirt or long trousers. In the wet season, it can rain for days, but you can, of course, experience dry conditions as well. Wear sturdy shoes because trail can be muddy and slippery at times. It is easy to get to Monteverde Cloud Forest Reserve no matter if you have your own car or not. Via car, you only need to follow signs from Santa Elena to the forest reserve which is at the dead end of the road. When using public transport, the first two buses leave from a station next to a bakery at 6:15 AM and 7:30 AM and from a station across the road from Sloth hostel at 1:20 PM and 3 PM. We believe that it is always much better to visit the reserve in the morning. Bus returns to Santa Elena at 8:30 AM, 11 AM, 2 PM, and 4 PM. One way ticket costs 700 colones. We took the first bus in the morning, returned at 11 AM and had enough time during this time slot to explore all the trails in the park without a guide. Monteverde and the area around Santa Elena will easily keep you busy for several days. Apart from hiking and wildlife watching in the cloud forest reserve, you can do other activities which became a standard in places with this type of climate. Ziplining | Santa Elena is the destination of Costa Rica's first zipline, and Monteverde, specifically a company 100% Aventura Extreme boasts with the longest zipline you can try in Central America. You can feel the adrenaline rushing through your body while swinging among treetops. Night tour | The cloud forest is alive all day long, but when the night falls, you have a unique opportunity to visit the reserve one more time and see it with new eyes. Different species of animals crawl out from their hidings, and your guide will be able to point out all of them and describe their behavior in their natural habitat. You can reserve the night tour in advance or choose from one of many tour operators when in Monteverde. Santa Elena Reserve | Monteverde's smaller sister, Santa Elena Reserve offers several hiking trails in the cloud forest where you can also see many monkeys, sloths, and birds. Approximately ten times people less visit this reserve than the famous Monteverde Cloud Forest, and the entrance fee is $14. Coffee Tours | The mountainous humid and cool climate, very similar to the one we experienced in Boquete, Panama agrees with coffee business. Costa Rica is famous for its coffee, and you can visit one of the farms around, learn how coffee is made and generally see the journey from the bean to a cup. Butterflies, Frogs, and Bats | Monteverde is a place where people are guaranteed to see butterflies, frogs, bats and much more. You only need to visit one of the gardens or centers and take one of many guided tours which will inform you about different species. Monteverde Orchid Garden | Personally, I think orchids are one of the most beautiful flowers whatsoever, and Monteverde also has a garden with different species of orchids easily accessible to all visitors. If you are traveling around Central America, you can also stop by in El Valle de Anton in Panama, another place boasting with orchids. Make sure you will visit the garden during the rainy season when flowers are in bloom. Canyoning Tours | We tried canyoning and rappelling down the waterfalls in other Costa Rica's destination, Jaco, but canyoning is another activity you can do here in Monteverde - another proof that this place offers the best from the Central American country, so in case your time is limited, you can easily build your Costa Rica's itinerary around visiting Monteverde. Horseback Riding | It is beautiful to observe the cloud forest from a different perspective, in this case from horseback. On a 4-hour tour you can admire the true rural Costa Rica's countryside. Hanging Bridges | If you don't suffer from vertigo, you can visit hanging bridges in Monteverde and get even closer to treetops from where you have a chance to see even more birds (the best time to see resplendent Quetzal birds is during their nesting season in March and April). When looking for accommodation in Monteverde, you might find confusing that google will show you options in Santa Elena instead. Generally, Santa Elena is the closest village to Monteverde Cloud Forest Reserve where you can find many restaurants and shops, and it is better for travelers without a car. Monteverde is a village along a road leading to the reserve lined with houses outside Santa Elena with many accommodation options as well (usually more expensive ones), and it is better to have a car to get there, otherwise, you will have to take a taxi or be dependent on infrequent public transport. Budget | Sleepers Sleep Cheaper Hostel - A new hostel close to the bus stop to the cloud forest, to restaurants and shops. Our room in this hostel was one of the nicest we stayed at in Central America for the price we paid. Mid-range | Camino Verde B&B Monteverde Costa Rica - Closest reasonably-priced hotel to Monteverde Cloud Forest offers a beautiful setting in nature, terrace, free breakfast, and Wi-Fi. Luxury | Chira Glamping Monteverde - A unique concept of luxury accommodation - you will sleep in fully-equipped upscale tents which have everything you might need, beds, or even hot tub! 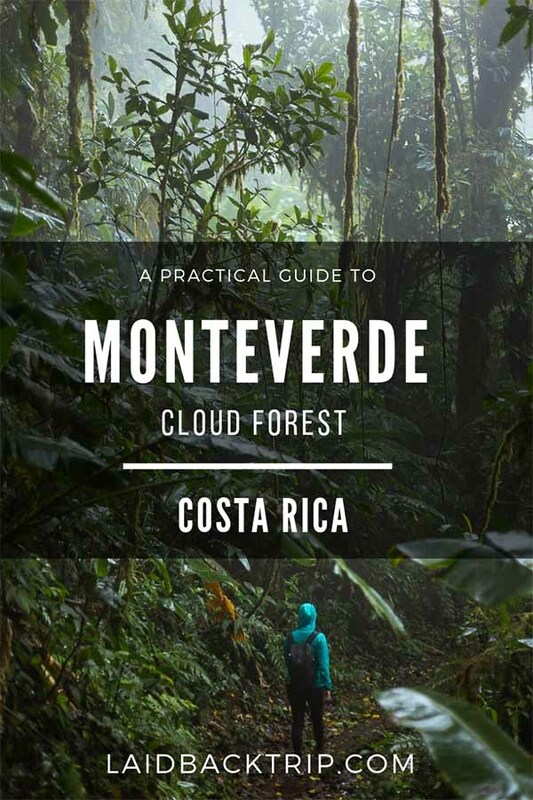 Although Monteverde is one of the premier parks in Costa Rica, it does not mean that reaching it is easy or quick. Despite the popularity, the road connecting Monteverde with other parts of Costa Rica is not in the best state, so it takes a while to reach this destination although distances are not great. But the most important information is that even though you don't have rental car or don't want to pay for expensive shuttles, you still can get to Monteverde respectively Santa Elena Village by public transport. If you are traveling from the capital, San Jose, the good news is that there is a direct bus between San Jose and Monteverde, but it still means that the bus stops to everyone who stands along the road. The journey takes around five hours. We traveled to Monteverde from Jaco - it required to take a bus to Puntarenas and there change a bus going to Monteverde. The route between Puntarenas and Monteverde took three hours with one bathroom stop. Another tourist destination from where people reach Monteverde is La Fortuna, a base for visiting Arenal Volcano. This is actually a route where most of the travelers including us (we continued to La Fortuna) use the tourist shuttle for $25 as it is much faster, plus the boat trip across the Arenal Lake is pretty scenic. We were quite unlucky that day as our boat broke down in the middle of the lake and it took us forever to get safely on the other side, but normally the route takes three hours. If you want to save some money and you are not limited by time, you can take a bus from Santa Elena to Tilaran (3 hours), and wait for two hours in Tilaran for a connecting bus to La Fortuna (2 hours).